Look what I found at Value Village (thrift shop) recently. 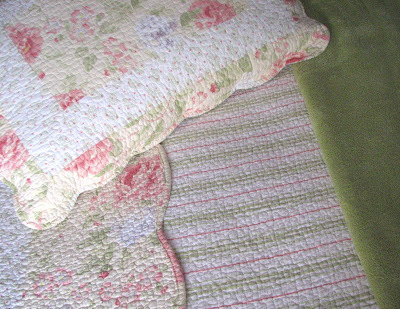 A pretty pink and green quilt with matching pillow shams. How could I resist? I like roses and my daughter loves stripes. We both liked the bright green accent color. 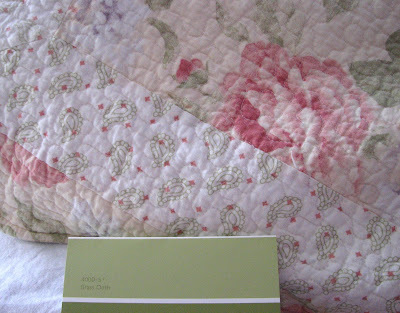 The quilt purchase soon lead to buying a green throw . . . .
and the new favorite color has lead to the discussion of paint chips. We'll see . . . so much for the bargain, LOL. 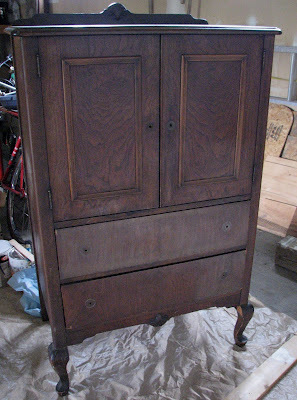 I have been working on refinishing an old dresser that will be quite pretty when it is done. I am painting it white and added a little texture to the front with scrolls and wooden appliques. I will add crystal knobs when it is done. I hope to have it finished next week. I am having an evening get-together for my neighbours and girlfriends. My daughter's room will be the designated coat room . . . so the pressure is on to finish the dresser. I have a full week to go, so I think I am OK for time. Here is a peek of my work so far. Here is the before picture. It was pretty dark and needed some TLC. It has a nice shape though. I have also been selling and buying stuff on my Kijiji. Have you ever used that site? I love it. It is for local items that are too big to mail. I sold the kids swing set (not used for several years now) and used the money to buy this beautiful cream Wing Back Chair. I was very happy with my "trade." 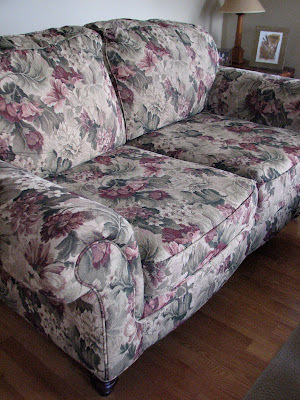 I also found this pretty love seat for peanuts and delegated our old one to the basement. It certainly is far cheaper than buying new. With teenagers and multiple pets it is a better way to go. This picture is for Brenda : ) You mentioned you were looking for a nice neutral color. We just painted the bathroom "Alencon Lace" . . . love the name by the way. It goes with any color scheme and provides a nice soft background. Karen it is amazing what one can find at Valu village. I love the quilt and shams,,,and it goes from there...one thing leads to another. I woke up to a snowy, windy day. no painting for me. Take care, hope your party goes well. Beautiful colors, so soothing and comforting. 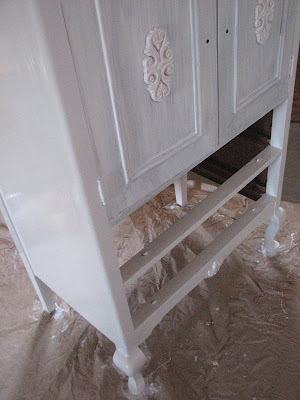 Love the dresser, I love to paint them white too! I've just discovered your blog i do not rmemmber where ffrom. I'm just so glad I found it. I love that quilt and shams. 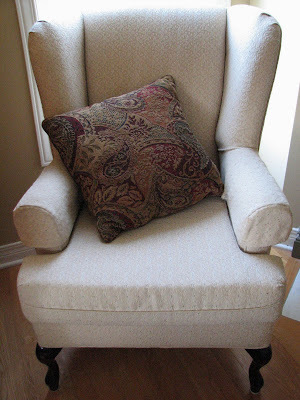 Find it so comfy and homey,don't you? I bought two from Provencce myself, one in white and theother with roses on one side and tiny floral designs on the other. My finds were not as lucky as yours as they cost me a real fortune... OK, let's put it this way: out of pure madness I just wanted to spoil myself a little. I love vintage and shabby chic home decor, antiques, laces and linens, smelly soap bars and have a rather "insane" (that's what my teenage daughter says) a crush for roses. Love visits and love reading comments. Hi Karen, I love the quilt you found at Value Village, and the green paint chips look a lot like the green I have in two of my rooms here which looks great with white furniture and pinks and even yellows :) I am loving the dresser you are working on, can't wait to see it all finished next time I visit. I found my puppy on kijijji last year, a lot of dog breeders sell through there but I have not purchased anything else. 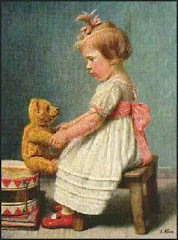 My daughter in Toronto has sold several things on Craigslist, do you have that? WOW WOW WOW Karen!! Loooove all these gorgeous things you found! 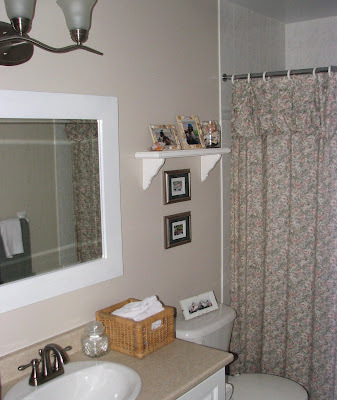 And your bathroom has such a cozy look! Have fun with the dresser!